Over the last two weeks, two of my friends have had their expensive smartphones stolen. They went through the usual drill: reporting the theft to the police, informing banks, telecom operators and family members. Both the friends had not installed “find my phone" apps on their devices. Had they done that, it would have made it a bit easier to search for the device. These apps are designed to track a lost device and even wipe out a phone’s content to prevent sensitive information from falling in wrong hands. Most of these apps require the same basic requirements to work: your phone must be connected to the internet, your location must be switched on and the app must have the requisite permissions. Another option is to use Bluetooth or GPS trackers even though these are more useful if you have lost your phone in known surroundings or at home. This app works on most Android devices. If you have this app installed on your phone, then you can find your phone by logging into your Google account from any other device. You can make the phone ring at full volume even if it’s on silent and erase the data on the device or lock it (this requires you to be signed into your Google account). If the location on your device is off, the app shows you the last known location of your device. You also have the option of seeing the battery percentage and network status of your device. There’s a similar service on iOS which lets you use any iOS device to find your phone and protect your data. All you need to do is install the app and sign in with the same Apple ID you use for iCloud. Find My iPhone will help you locate your missing device on a map. You can remotely lock it, play a sound to make it discoverable in case it is nearby, display a message, or erase all the data on it. This also extends to other Apple devices like the Apple Watch and Macs. However, Find My iPhone must be enabled in the iCloud settings of your device before you can use the app to locate it. Prey is a third-party security app which comes with the same features as the first two apps, but also provides additional options. First, you need to set up a Prey account and list all your devices that you want to track. The app lets you manage multiple devices at the same time. You can set up “control zones" on your device to detect if it moves in or out of a certain area. The “evidence reports" option kicks in once you mark a device “missing" in Prey’s online panel. 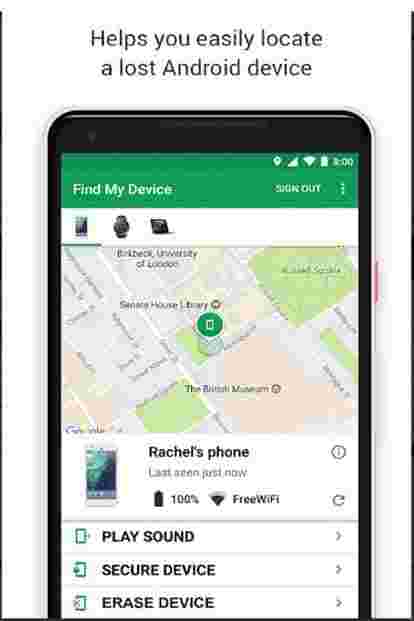 Users can then start gathering evidence about their lost device—including pictures and screenshots, a log of an active nearby Wi-Fi, location coordinates, the media access control or MAC and IP (internet protocol) addresses to confirm if it is their device.